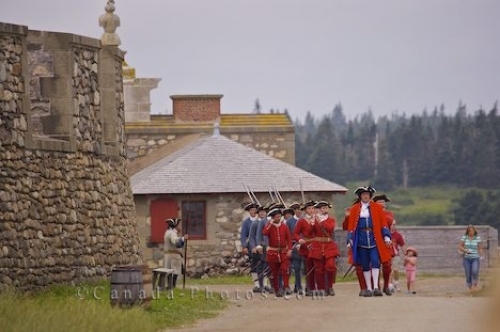 Tourists follow beside the military procession in the Quay at the Fortress of Louisbourg in Nova Scotia, Canada which is led by an officer dressed in clothing relating to the 18th century. This military procession is the onset to the cannon gun firing which is performed daily for visitors to the Fortress of Louisbourg. The old fortress buildings made from stone, line the street at this historic national site where the military procession passes by. The cannon gun firing is re-created from the early days when it was used as a defense device when trying to protect the fortress. All the employees at the Fortress of Louisbourg are dressed in time period costumes to give visitors the true feeling of the way life was in this French fortified town. The military procession and the cannon gun firing are just two exhibits to see along with the homes, stories, dances, music, shops and the dining establishments all relating to the 18th century. Picture of the military procession at the Fortress of Louisbourg in Nova Scotia, Canada before the cannon gun firing. Military procession in the Quay led by an officer prior to the cannon gun firing at the Fortress of Louisbourg, Louisbourg National Historic Site, Highway 22, Fleur de lis Trail, Marconi Trail, Cape Breton, Nova Scotia, Canada.